Sharing is just what I’ll be doing this coming Wednesday. I’m teaming up with the lovely team at Little Choc Apothecary, an all-vegan crêperie in Brooklyn, to host a 5-course vegan dinner in honor of springtime, Earth Day, and vegan community here in New York. This socca is on the menu, along with my minted pea soup, the arugula French lentil salad from Food52 Vegan, and a really delicious vegan dessert crepe with hazelnut praline, dark chocolate, and vanilla cashew cream. Little Choc is a woman owned business, and its owner, Julia Kravets, is absolutely tireless. She’s at Little Choc every day, often whipping up crepes while also greeting customers and keeping up with social media. 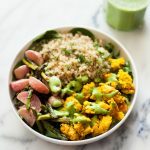 Julia spent ten years in the fashion and modeling industries, until going vegan changed her life and inspired her to go back to cooking school. Now she’s proving that creative, sweet and savory buckwheat crepes can be created without animal products. If you’re in the area and would like to check the dinner out, you can learn more here. I’d love to meet you! In the meantime, I’m excited to be sharing one of the highlights of the meal with you. This socca is so simple that at first I wasn’t sure whether it belonged on the menu of a formal, sit-down meal. 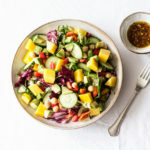 But if there’s anything I keep learning and re-learning about cooking, it’s that simple food—good bread, a really fresh salad, a perfectly seasoned bowl of soup—is what most of us crave. Embellishment isn’t necessary, especially when ingredients are fresh and appealing. This socca is all about contrast: crisp greens, creamy avocado, cool toppings over a warm chickpea pancake. You can serve it with a soup or a nice salad for an easy lunch, or slice it up and serve it as an appetizer or finger food with friends. Whisk together the chickpea flour, salt, 2 teaspoons olive oil, and water, until no clumps remain. Allow the socca batter to rest and thicken for at least 30 minutes, and up to 2 hours. In the meantime, preheat your oven to 450F and place a 10 or 12-inch skillet into the oven. Add one teaspoon oil to the skillet and swirl or brush it around to coat. Pour the socca batter into the hot skillet (it'll sizzle, so be careful!). Transfer the skillet to the oven and bake for 10-15 minutes, or until the socca has set and the top is golden. For a crispy top, you can bake for 10 minutes, raise the oven heat to a broil, and put the socca in the broiler for the last 2 minutes of cooking. While the socca bakes, blend all green goddess dressing ingredients together till smooth. When the socca is ready, brush the top with the remaining teaspoon oil. Top with the greens and avocado slices, then drizzle generously with the green goddess dressing. Serve. If you give the socca a try, let me know what you think! I’m guessing it would be lovely with steamed asparagus, baby broccoli, or even sautéed kale. Happy springtime. I’ll be back later this week with an easy, nutritious snack/breakfast/dessert dish. This is bursting with spring and freshness, socca is one of my favorite flavors – ever. And the sound of this dinner! So exciting Gena! Based on your last comment on my site, know that I love you and am sending cookies and sunshine your way. Constantly. Hugs upon heaping hugs to you Gena. And have so much fun next week at this dinner, wish I could beam myself there! I love socca, but have never made it myself. Now that you’ve posted this I have to try it- this looks like spring on a plate. I recently discovered socca and I LOVE it! So excited to try this version. 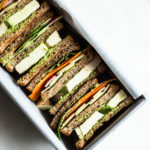 It looks so fresh and full of the spring flavors I have been craving! mmm…this looks tasty, and it’s so pretty too! This looks beautiful. 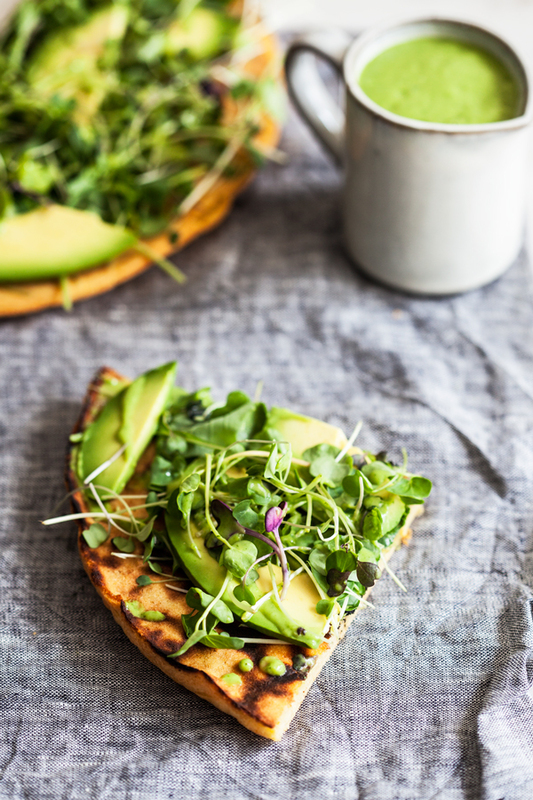 The microgreens, avocado and green goddess add so much freshness – it kind of reminds me of a super-healthy green pizza! I’ve never come across socca before, yet it looks sooooooo good! I follow a simple rule, if it’s green, it’s good. Thanks for this great recipe. This looks just lovely – everything a Spring dish should be…and equally delicious. I am looking forward to trying this one! I’ve been wanting to try socca for so long and just haven’t gotten around to it. I want to make it happen soon though and I’ve been reading so many different recipes. I noticed that this one here uses less water than the one in your cookbook- does this make for a sturdier version? With the abundance of so many bright and fresh toppings, what a beautiful spring lunch. 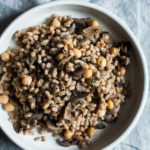 what a lovely and unique recipe with healthy touch.